Happy Bloggers Challenge Friday! Thanks to those who played along with last weeks Things with Wings Challenge, I enjoyed the wonderful entries as I made my way to your blogs to comment! This weeks Challenge theme is They Say it's your Birthday. Those of you have been playing along with the Bloggers Challenge, know I usually through in a birthday challenge, when someone in my family is celebrating a birthday. We do have a birthday coming up, actually two in the next two weeks, our fur child turns 10 on Monday, and our youngest son turns 18 - crazy how fast time flies! I was going to use this challenge as an opportunity to get a card created for DS, but my creative side had other things in mind - LOL! I created a Mixed Media card using Dylusions Sprays along with the Gelli Art Plate and stamps from North Coast Creations. Here's the background after I pressed my Mixed Media panel onto the sprayed Gelli Arts Plate. The splotches you see are splashes of water that I threw onto the wet ink to remove some of the coloring. After stamping the image and sentiment in Black Archival, I sponged ink over stencils from Prima and The Crafters Workshop to add some layering. For additional layers, I added Gesso through the Prima stencil (small dots) and dipped a spray cap into gesso to create the larger circles. If you'd like to play along with this weeks Bloggers Challenge, please link back to this post on your blog and mention you created your card for the Bloggers Challenge They Say it's your Birthday Challenge. Please add your link using the Link Tool below, your link should be a direct link to your Bloggers Challenge Post, use your name as the Title. Please do not link to cards that were created prior to the challenge date. Entries not linking properly, or backlinked will be removed. If you have the captcha enabled on your blog, please consider turning it off, as it makes it so much easier to leave comments. I love the wet splotches, need to remember that when using sprays. Fabulous background-love the bright colors! Amazing color GF! Love the subtle traces of this and that, here and there. Absolutely love that background and the silhouette just sings against it! Awesome card! I love the bright colors with the black silhouette. Thanks for the birthday challenge. This is beautiful, Lisa! Love the bold colors of the background along with the black silhouette image. Love your bright background Lisa! I'll have to try this with my Gelli plate - I've only used it once and I used acrylic paint on it - love the look of the sprays! Thanks everyone for sharing some beautiful inspirations this week. Your card is so lovely! I just received some dylusion paints, I am going to bookmark your blog so I can come back and read this and try to do what you did! Thanks for the tutorial! 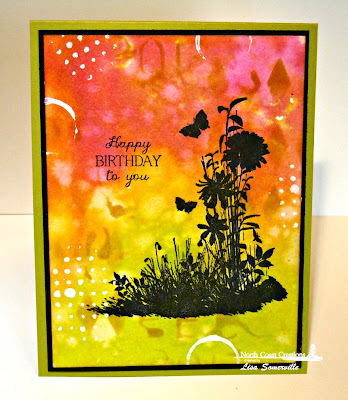 Fabulous card, love the colors!......thanks for the challenge! Wonderful birthday card, Lisa! I always love the backgrounds with water spots! Off to make a B-day card!